This post originally appeared on Franck Marchis' Cosmic Diary blog and is reposted here with his permission. Today, NASA-funded scientists announced a major new step in the search for life on Enceladus, Saturn’s sixth-largest moon, thanks to new data collected by the NASA/ESA Cassini mission. Enceladus has attracted a lot of interest because it has an active pole that spews jets of material into outer space. During its last flyby over that pole, an instrument on board the Cassini spacecraft detected the presence of a biomarker—molecular hydrogen. This suggests that the ocean we know lies beneath the moon’s surface could indeed contain an ecosystem similar to the ones we find in deep-sea hydrothermal vents on Earth. 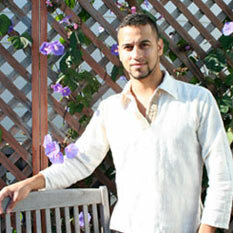 Hunter Waite, a researcher at the Southwestern Research Institute in San Antonio, Texas, is the lead author of a paper describing the findings in an upcoming issue of Science. In the piece, the team explains that the molecular hydrogen (H2) content was measured using Cassini’s INMS instrument, a mass spectrometer capable of sniffing the molecular composition of gas that it captures. This cutaway view of Enceladus shows the moon's core, possible hydrothermal vents, ocean, ice layer, and jets that vent material into space. During one of its last flybys of Enceladus on October 28, 2015, the spacecraft grazed the moon’s southern pole at 8.5 kilometers per second, just 49 kilometers above the surface. It crossed the active region where jets spew material from the ocean that we know is located below the icy surface. On three previous flybys, scientists had managed to measure the composition of the jets’ material, and detected molecules of water, carbon dioxide, methane, and ammonia. During the October 2015 flyby, they used the instrument in a mode they hoped would allow them to measure the content of hydrogen molecules in the gas of the vents. They succeeded—Cassini detected molecular hydrogen. This is important because the gas is used by microorganisms, known as methanogens, to produce methane from carbon dioxide. 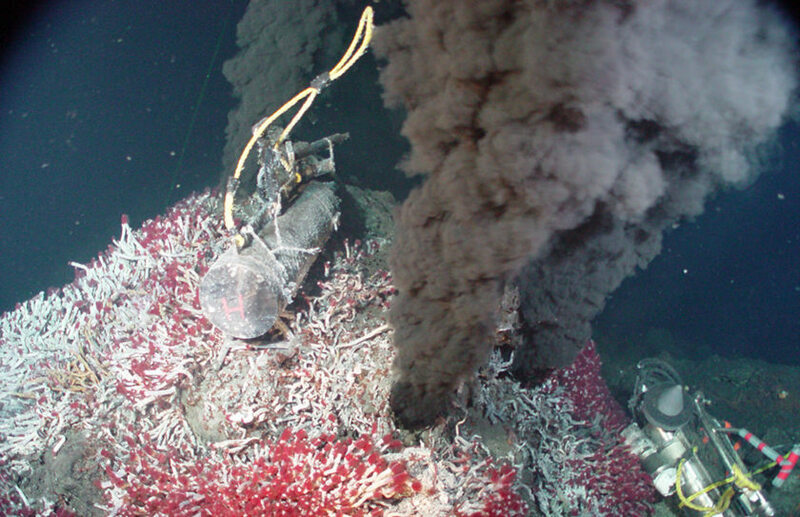 Thriving ecosystems seen in the deep oceans of our planet near the volcanic hydrothermal vents of the mid-Atlantic ridge, for instance, depend on the production of energy using this chemistry. The scientists are very careful when discussing the origin of this molecular hydrogen. They show that the high concentrations measured are not compatible with a geological origin—in other words, such a large amount of molecular hydrogen couldn’t have been stored in the ice shell or in the ocean. Similarly, the scientists are confident that strong radiation on the surface of Enceladus can’t be the source of this molecular hydrogen. They conclude its source is probably hydrothermal reactions between water and rock, emerging out of active volcanism, as it happens in submarine hydrothermal systems on Earth. The source of this volcanism on Enceladus is still not fully understood, but it is probably related to tidal dissipation in the moon’s core, which is squeezed and warmed as the satellite orbits the gas giant Saturn. As with Europa, a moon of Jupiter, this heat warms up the interior, creating an ocean with hydrothermal activity and surface fractures from which materials can escape in space. It must be emphasized that the scientists did NOT report the detection of life in Enceladus’ ocean, but rather the detection of molecular hydrogen—the final piece needed to infer the presence of methanogenesis. A model including the characteristics of the ocean (temperature, pH, mixing ratio and composition) supports the idea that methanogenic life could survive in this environment. But thermodynamic models alone are not enough to claim that life is indeed present on Enceladus. In other words, “habitable” does not mean “inhabited,” and this distinction is important for astrobiologists. A bed of tube worms surrounds a hydrothermal vent deep in the northeast Pacific Ocean. A targeted flyby of Enceladus occurred shortly after this one, on December 19, 2015. The team is probably analyzing more data, but it is not clear that the spacecraft’s INMS instrument was used again to collect observations. With the end of the Cassini mission scheduled for this September, the next step in the study of Enceladus and the understanding its habitability would probably be the design of a mission dedicated to the study of the satellite and the analysis of its jets. A mission concept called JET was proposed in the last NASA Discovery round of proposals but was not selected. This latest discovery may reactivate interest in sending a spacecraft dedicated to the study of this small (272-kilometer-radius) moon of Saturn. Enceladus and its warm hydrothermal vents could be the place where we one day find life. Microbiological life, most likely, but life—and I for one would be extremely happy with that. I thought that the leading theory that prompted speculation that hydrogen might be being released was that Enceladus's heating was being driven by serpentinization? Prior to the disappointing results from Mariners 2 and 4 over half a century ago, the paradigm was life was everywhere except the smaller moons and asteroids. Since then, Life-denial has been the basic paradigm in space travel. The famous (notorious) martian meteorite fossils were debunked prior to have had the reasons for the debunking debunked. The famous (notorious) results from the two Viking probes in the '70s were also never debunked, although there were lame attempts at the time that were accepted. That a theory it was caused by a non-biological cause was the leading one, is to be expected. 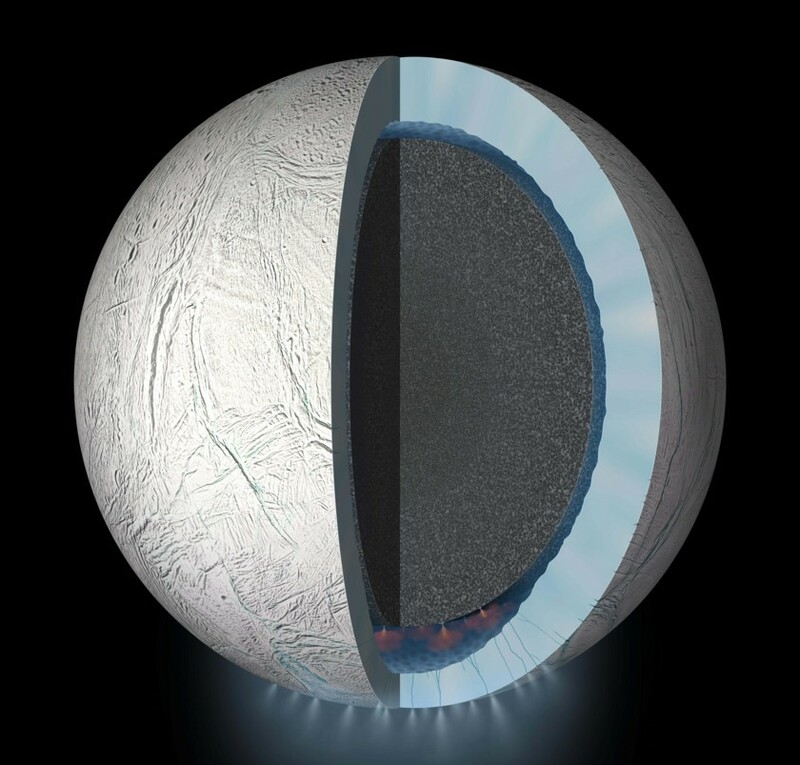 NASA should fund the Enceladus Life Finder mission.